Off season, the ancient Greek temple of Segesta is devoid of tourists. The plane touches down on a runway sandwiched between a craggy inland promontory and the Mediterranean, which heralds a gleaming welcome to Sicily. It is early December as I leave the airport in a lilliputian silver rental car to begin a mini odyssey. 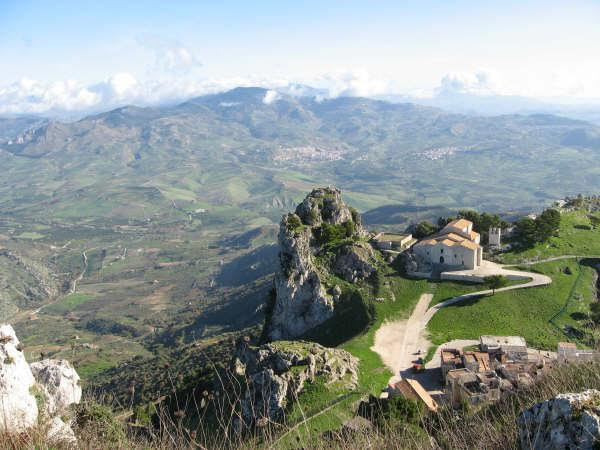 Western Sicily is less overwhelmed by tourists than the eastern part. I am a solo woman traveler in Western Sicily in the off season. When I arrive early in the week the restaurants that are not already closed for the season are shut tight Sunday and Monday, and the solitude hangs like the weight of Hercules. Almost immediately, my car is the only one on the road. A modern highway bisects Sicily’s interior, but it is easy to become entangled in the old network of back roads. Sheep boldly cut in front of me and give me sullen, Sicilian glares for intruding on their turf. The digression provides an unforgettable first impression: an empty, green landscape beneath a blue sky half-heartedly darkened by clouds attempting to rain. This fertile countryside earned Sicily a reputation as the bread-basket of the Roman Empire. 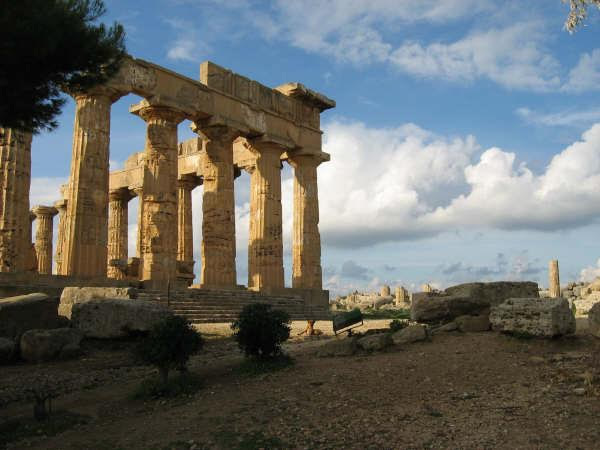 Part of Magna Graecia, Sicily is littered with some of the world’s best preserved Greek temples. Segesta is a magnificently preserved Doric temple set in the midst of rolling hills. Founded in the 5th century B.C., Segesta existed for 1,800 years under successive waves of Greeks, Romans, Muslims, and Normans. In the Aeneid, Virgil mentions Segesta as a prosperous city. But by the thirteenth century the city was abandoned. Off season the site is devoid of summer’s tangle of tourists. No tour buses clog the parking lot, where my car joins three others. Four German tourists hurriedly take snapshots and leave. Afterwards, alone, I absorb the stillness. I am drunk with the temple’s beauty, made more intense by its setting: caressed by the sun’s golden rays and heroically perched on a hill with views to shaggy green fields. The marvelously preserved and beautiful ancient Greek temple of Segesta, which lies peacefully amid wild green fields and rolling hills. The temple of Hera, a relic of the former ancient Greek colony of Selinunte. 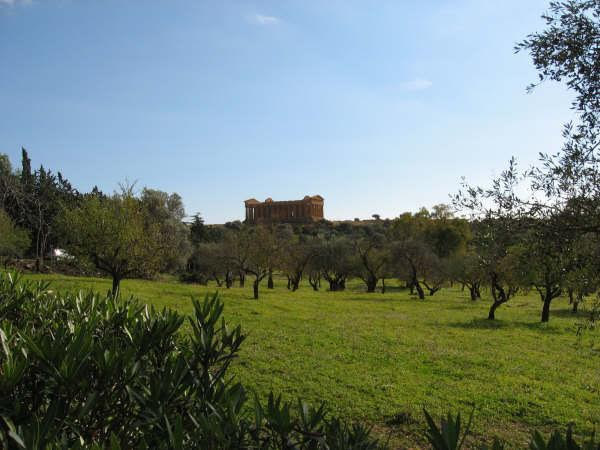 I continue southeast to Agrigento and the Valley of the Temples. Except for a small collection of Japanese tourists and a French couple who are easy to avoid, the place is almost deserted. The sun pouts histrionically behind thick clouds. Gnarled olive trees blanket the site. The 5th century B.C. Temple of Concordia was preserved when it was reincarnated into a church in the 6th century A.D. The unfailing Mediterranean sun stubbornly slices through steel clouds and splashes the edifice in late afternoon’s glow. Olive trees in the Valley of the Temples. The sun’s angle heralds winter solstice. Agrigento’s ancient winter festivals must have really been spectacular. Back then, life was more uncertain, and starvation was common during the cold winters. Early December, one of the few times of year when fresh meat was available, was when livestock was slaughtered to have fewer hungry mouths during winter. Also in early December, beer and wine was finally ready for the ensuing revelry. Celebrations centered around light, adding cheer to the long night while providing hope for the sun’s return. Ancient Greeks celebrated winter with the Lanaia (Festival of the Wild Women), when they sacrificed a man or a bull representing Dionysus, who was eaten by the Maenads (female followers of Dionysus). In classical Greece human sacrifice was replaced with a goat and the wild women became funeral mourners. The Romans celebrated Saturnalia, with feasts, animal sacrifices, and the exchange of presents. The celebrations culminated in Sol Invictus on December 25, the rebirth of the “invincible” sun. Initially banned by the Catholic Church as a pagan holiday, Sol Invictus eventually became Christmas. Many countries, including Italy, still continue the traditional twelve day celebration, ending on Epiphany (January 6). Late afternoon view of the sea from Seliunte. Cutting inland, I take a wrong turn. The road serpentines through what feels like every town center in Sicily’s interior. Most Sicilian villages are not decorated for Christmas in the commercial way that is so common in the U.S. The local radio waves play everything from beebop to Italian pop rather than Christmas jingles. The detour leads to Caltabellota, a small village perched atop a rocky crag. My guidebook calls it “mist-shrouded”, but during my visit the view extends 19 kilometers to where an azure haze announces the Mediterranean. 800 meters above the town sit the ruins of a Norman castle. From this aerie, green slopes drop precipitously on all sides. The town spreads out in a warren of narrow medieval streets and terracotta rooftops. An icy wind threatens to dispose of my guidebook. Caltabellota drapes on the hillside. Leaving the town on a street that tilts at 45 degrees and narrows to a footpath, my heart pounds. Steeling my nerves, I head back up the hill in search of a new route. But the steep streets are not kind on stick shifts, and my car lacks horsepower. It dies below a 60 degree zigzag. With a sickening crunch the car jams against a guardrail protecting a house which is centuries old. It is the siesta hour and the only person on the street is an old woman. Wildly gesticulating and spouting a frantic mix of Spanish and Italian I yell, “Ayutame per favore!” She shrugs, “I’m an old woman, what can I do?” I throw women’s lib to the wind and blurt out, “I need a man!” “Oh,” she replies, this being a perfectly natural request to her, “Around the corner, in the bakery” she points. In the bakery a flurry of men are dressed in uniformed white shirts. I exclaim, “Ayutame per favore! Tengo problemos con mi auto!” A young man throws on his jacket and looks inconvenienced, as if this happens every day. He looks at the car, scratches his head and sighs, “Mamma mia!” But he drives the car safely up the hill like it is second nature. I am thankful that there is no permanent damage and drive on, undaunted. The view was worth it. Church at the top of Caltabellota. My battle-scarred vehicle eventually discovers Caltagirone. Muslims brought majolica glazing to this hilltop town in the 11th century (in Arabic “qal ‘at-al-ganon” means “Castle of the Genies”). These days, ceramics litter Caltagirone: on the sides of houses, decorating bridges, and adorning the 142 steps of the Scalinata di Santa Maria del Montes that lead from the lower (newer) town to the upper (older) town. The only other foreigners are three Americans on leave from the nearby U.S. naval base, shopping for Christmas presents. Sicily is second only to Naples for presepi (terra cotta nativity scenes), and Caltagirone is its capitol. School children form a line in the increasing drizzle outside a local museum where traditional presepi are on display. Scalinata di Santa Maria del Montes in Caltagirone. 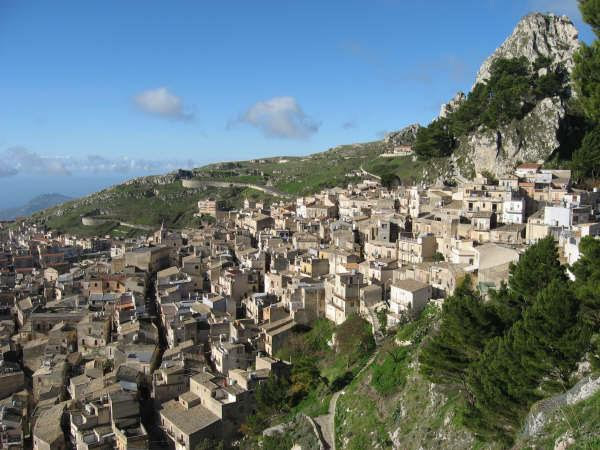 I point my battered car toward Noto, a wedding-cake of a town in Sicily’s southeast corner. On arrival, I wonder if I am as tired as other visitors to Noto: the road, a perpetual roller coaster, meanders past countryside crawling with Sicily’s famous Nero d’Avola grape. 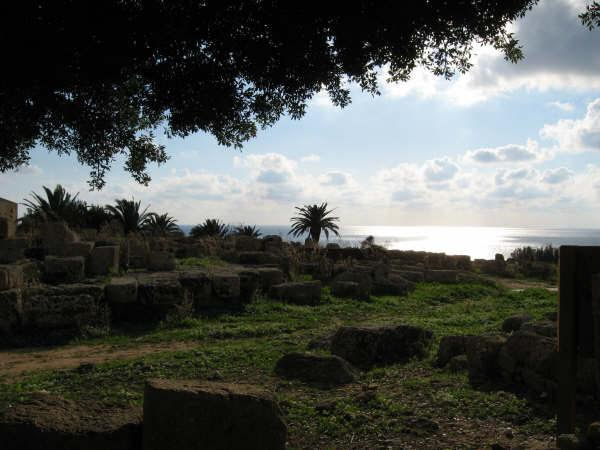 Other visitors to Noto tired out: Daedalus rested here after his flight over the Ionian Sea, as did Hercules after his seventh labor. But Noto is worth the effort. Destroyed by the 1693 earthquake that felled most of southeastern Sicily’s towns, Noto was re-built in grand style. To my profound relief the streets are set on a grid. But a Sicilian’s idea of a grid is different from a New Yorker’s and the streets still meander gently enough to be romantic. I arrive at the end of the day, when the sun’s rays bend over the city and cast a honeyed glow over the town’s tufa buildings. A masterpiece of Sicilian baroque, there is too much beauty here for one pair of eyes to appreciate. 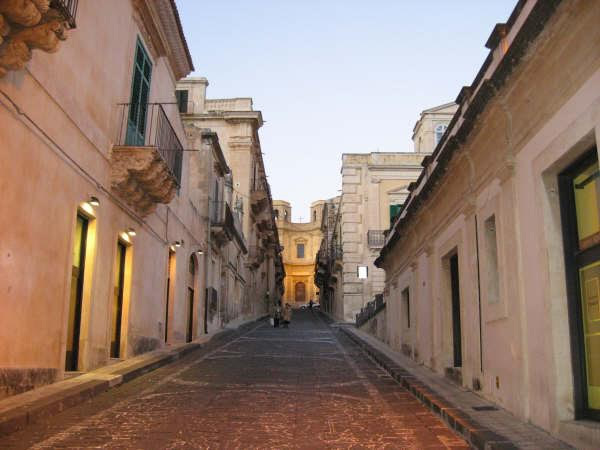 A street in beautiful Noto. I want to stay in Noto forever, but Syracuse awaits. Over 2,700 years old, Syracuse was once the capital of Sicily and one of the premiere powers in the Mediterranean. Cicero called Syracuse “the greatest Greek city and the most beautiful of them all.” A center of learning in the Greek world, Syracuse rivaled Athens in cultural importance. The mathematician and philosopher Archimedes (the bane of high school geometry), the great playwright Aeschylus, and the poet Sappho all lived here. Plato visited the town several times. Later, plague and cholera followed. Syracuse was a center for Sicilian Jews until the Spanish Inquisition expelled them in 1492, emptying Syracuse of half its population. 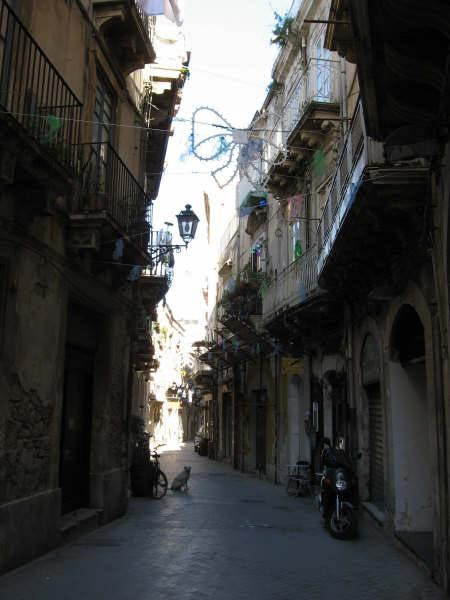 Their presence can still be felt in the old Jewish quarter on the island of Ortygia, the heart of the ancient city. I stay on the via della Giudecca in a hotel beneath a 6th century A.D. mikveh (ritual cleansing bath), which was discovered during restoration. Other Jewish artifacts decorate the hotel’s sitting room, but there is no menorah even though Hanukkah fast approaches. A Christmas tree’s lights bathe the room in cultural anachronism. There are de riguer sites to see: the cathedral built over a 7th century B.C. Greek temple of Athena (whose columns can be seen both inside and out), and the Greek Amphitheatre, one of the largest in the Greek world (it can seat 16,000). And yes, I have the amphitheatre to myself, as I sit on the ancient stone benches and imagine Aeschylus’ plays Prometheus Bound and Prometheus Unbound premiering here (which they actually did). Mostly I get lost in the maze of medieval streets on Ortygia. A few Christmas decorations add color: toy Santas stick out plump bottoms as they climb ropes slung over balconies, and at night white stars illuminate the passageways. In the drizzle the place feels like other centers of learning: Oxford, Florence, and Boston. Common to all is a sense of melancholy. The Greek Amphitheatre in Syracusa. I peer through half-closed doors to cramped quarters, not yet converted into elegant vacation homes, although the hammering of restoration resounds throughout the streets. A narrow bridge connects the island to the mainland and in the slim stretch of water between the two, schoolboys in kayaks play a game resembling water polo. Traveling alone in the off season can be a boon or a bust. On the one hand, most tourist sites are empty (if they happen to be open). On the other hand, battling loneliness can put a damper on things. Best to choose a destination whose beauty, history, or people fill the void. Having a tolerance for bad weather and for getting lost can also yield unexpected pleasures. My solo odyssey through Sicily left lasting impressions of serenity and beauty. I wonder how so many tragedies could possibly happen here: wars, poverty, famine, the treachery of the mafia? If I lived here, I would simply bask in beauty and celebrate life.